Ballston-based startup Fend is working to make infrastructure assets un-hackable. Dunn said he was frustrated looking at new technology being developed for infrastructure development that was turned down because of cybersecurity concerns. Fend’s hardware is a device inserted into the data stream connecting industrial equipment (the asset) to cloud network stream. Information comes in from the asset, like a power plant or a truck, into one half of the device. That data is converted into a unidirectional beam of light fired into the second half of the device, which then sends the information into the network. Because the information is physically transported in a one-way beam, there’s no opportunity to use the hackable network to access the asset. Dunn says Fend allows equipment operators to receive live updates on the assets without concern that the asset could be compromised. According to Dunn, the technology adapts technology that has been used to defend nuclear power plans and the intelligence community but makes it easier to use and more price accessible for building owners or local governments. Fend started in 2017 out of Smart City Works, a business accelerator in Reston, but has since moved to Techspace, a shared office space in Ballston. It was awarded a Department of Energy Small Business Innovation Research award earlier this year for the technology’s potential to help protect solar farms. According to the Department of Energy, the technology could prevent large-scale economic disruption. 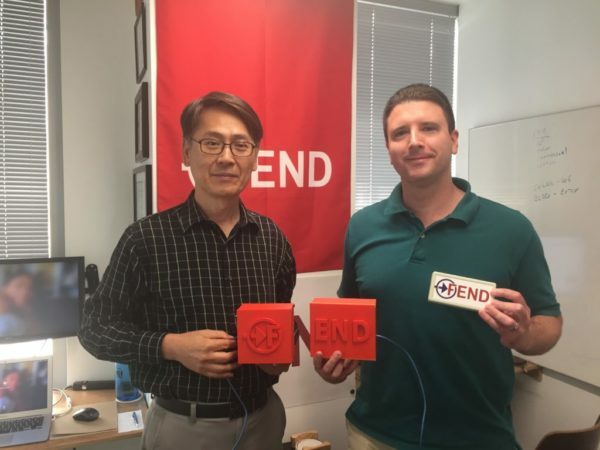 The funding from the Department of Energy has allowed Dunn to bring on another full-time employee, Sang Lee, who is now the chief engineer for Fend, and move forward into a pilot phase. The first batch of 10 units are currently under construction in Charlottesville and will be ready in four to five weeks. Dunn said the program is scheduled for six weeks of pilot testing as Dunn starts to work on developing clients. Currently, Dunn says the company has one outside investor, but Fend will be looking for more investors and clients as the program looks beyond the pilot into full-scale implementation.